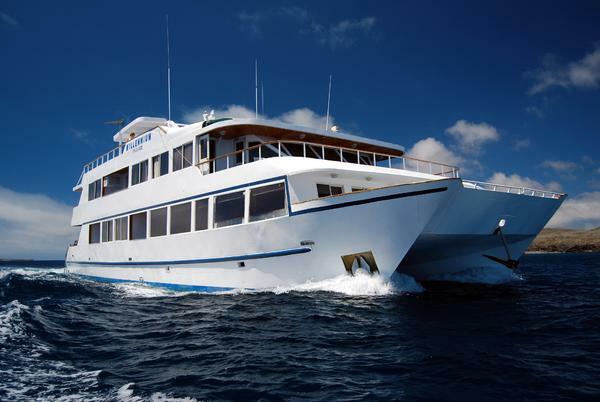 Specially designed for cruising and exploring the Galapagos Islands,Millennium Catamaran offers an elegant and comfortable way to visit the Enchanted Islands. Constructed with non flammable materials and supported by two steel hulls making it more steady and safe. The Millennium is certified with high standards of security for lodging 16 passengers who can live their most enjoyable experience. 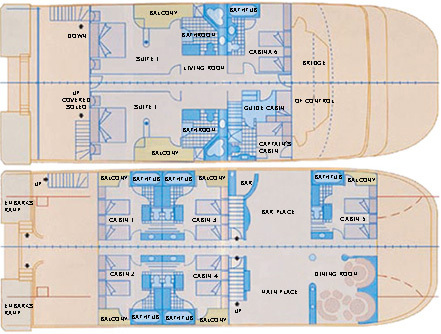 Six of them are double twin low beds: five with private balcony and one with a large window which is assigned when children are traveling for security. Besides, two very spacious owner suites with matrimonial bed, resting area and private balcony. Suites can be offered for triple occupancy as they count with a sofa bed. The Millennium is fully air-conditioned and features a large dinning room, living room and bar, inside and outside bars, three different solariums and BBQ area. Safety: 2 Zodiacs, 10 passengers capacity each. 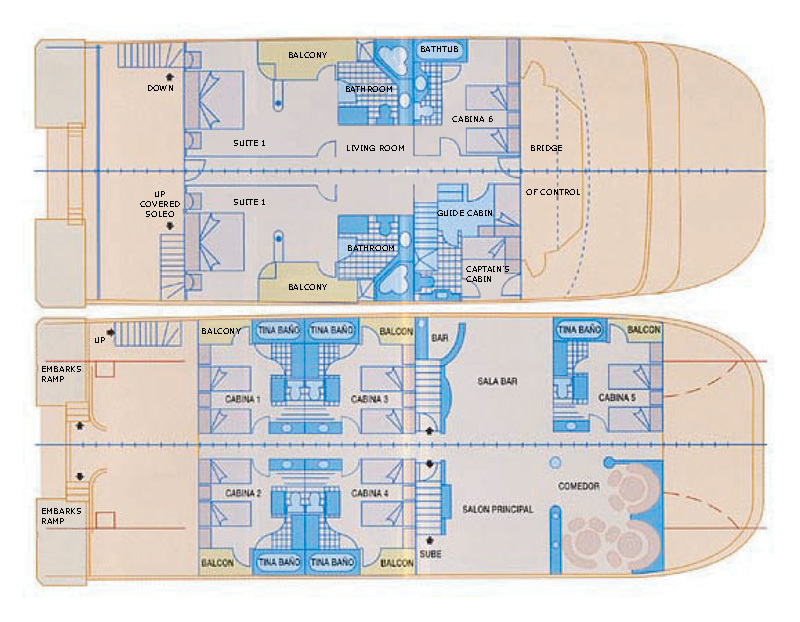 1 Life raft 25 passengers capacity. First Aid and oxygen equipment on board, lifesavers equipment, alarm,and fire equipment. Navigation: 24 miles Furuno Radar GPS, Satellite Navigator, Depth finder, HF- VHF, Valise satellite radio, Emergency Position Indicating and a complete safety equipment according with The International Coast Guard Regulations. Departure from mainland on Aerogal airline, flight 2K030 at 09:45. The plane will make a short stop to pick passengers in Guayaquil. Landing at the airport of San Cristobal will be approximately at 12:00. Upon arrival to the airport, passengers will be met by our staff and transferred to the MILLENNIUM CATAMARAN, docked at Puerto Baquerizo Moreno, in San Cristobal Island. The first visit is to La Galapaguera, at the highlands, in Cerro Colorado, where we can find Galapagos tortoises living in the wild; also we can enjoy a magnificent landscape. Española, which is the southernmost island of the archipelago and because it is so isolated, has a high proportion of endemic fauna. Points to be visited on the Island are: Gardner Bay, offering a great possibility for the visitors to enjoy some beach time in the Galapagos. Here, the extroverted mockingbirds sit on top of visitor's hats, peck at their feet and investigate their belongings. Punta Suarez, is one of the most popular and attractive visits at the Galapagos. The quantity and variety of wildlife at this site are remarkable. When landing, young sea lions surf the breaking waves, while a few steps inland groups of the Española variety of iguanas bask in the sun. Further inland, masked and blue-footed boobies nest almost right on the trail, Galapagos doves peck around unaware of visitors and finches go about their business in the bushes. The trail continues toward the cliffs and the blowhole, a fissure in the lava where water spurts high in the air like a geyser. Also Swallow-tailed Gulls and Red-billed Tropicbirds can be seen. Further up the cliff, in an area of low-lying reefs, is the only place where the Waved Albatross nest. Floreana Island, an island with beautiful visitor’s sites and some strange stories. Here we visit Post Office Bay and its post box where sailors used to leave mail in the past, and is still in use today. Punta Cormorant is a greenish beach due of olivine crystals in the sand. Santa Cruz is the second largest island in the Galapagos. The small town of Puerto Ayora is the economic center of the archipelago, with the largest population of the 4 inhabited islands. Riding to the Highlands, will visit Rancho Primicias for lunch. Its greenery lush is a welcome contrast with the arid scenery of the smaller, lower islands. Back to Santa Cruz Island, in Puerto Ayora, passengers will visit the Charles Darwin Research Station, which is also a tortoise breeding and rearing center, where tortoises of different subspecies are prepared for reintroduction to their natural habitats. Santa Fé Island the vegetation of the island is characterized by the presence of the largest species of the giant opuntia cactus. Visitors will have a panga ride and do snorkeling. Plazas Islands: two small islands just off east side of Santa Cruz Island. One on the main characteristics is its unusual vegetation comprised of Opuntia Cactuses and Sesuvium plants. This island is one of the best spots to see land iguanas and swallow tailed gulls. The cliffs of the southern shore are a magnificent observatory to see marine birds in their habitat. Rabida, one of the special features of this island is its remarkable red color, which is a result of the high percentage of oxidized iron in the composition of the lava. Flamingoes and White-cheeked Pintail Ducks can be seen in a salt-water lagoon near the beach. In the saltbushes that encircle the lagoon, Brown Pelicans build their nests. It is rare to see the offspring of these birds elsewhere. Walking up to the southeastern part of the island, there is an observatory from which the startling red color of the beach and the rocks can be appreciated. Puerto Egas, the landing is on a black beach with eroded rock formations in the background. The trail crosses the dry interior, where the remains of a salt-mining enterprise can still be seen and then continues along the coast. Intertidal pools are home to a variety of invertebrate organism. Land iguanas are scattered around feeding on exposed algae while Oyster Catchers try to capture Sally Lightfoot Crabs. The lava and the black sand seem to catch fire and the animals acquire a surreal quality. Bartolome is famous for its Pinnacle Rock, which is the most representative landmark of the Galapagos. Precariously walking on the rocks at the base of the Pinnacle Rock are Galapagos Penguins, the smallest species of penguin and the only one found north of the Equator. At the beach on the southern side, there are nesting sea turtles (in season), wading in the shallow water near the shore. White -tipped Reef Sharks patrol close to shore. The site is like a vulcanologic museum, an eruption site left untouched after the explosion. If it weren't for the small lava lizards scurrying around, the pioneer Mollugo plants, and the gravity, the visitor could be well walking on the surface of the moon. North Seymour is also one of the islands uplifted by underground seismic activity. It is considered as one of the best places to see Blue-footed Boobies and admire their courtship dance. Magnificent frigate birds are also seen. At the interior of the island, one stumbles upon the biggest congregation of red pouches in Galapagos. Isla Lobos, a small islet at the north of San Cristobal. Here it is possible to see sea lions resting on the lava shores. The site is also the nesting place for blue footed boobies and frigates. Good possibilities for snorkeling. All itineraries in the Galapagos Islands are subject to change without previous notice due to National Park and Marine authorities regulations, operational matters, weather conditions, or at Captain´s decision when considred for passengers security.